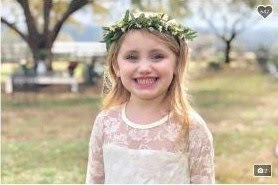 The girl, identified as Millie Drew Kelly was shot Monday evening at their subdivision about a 40-minute drive northwest of downtown Atlanta, the Paulding County Sheriff’s Office said. CNN reports that the siblings were in a car in their driveway, preparing to go to the boy’s baseball game, when the vehicle failed to start. The mother excited to try to find out what was wrong with the car, authorities said.